The only “Thriller” that was supposed to appear in the Stan Sheriff Center on Thursday night was a flash mob dance routine in the student section. 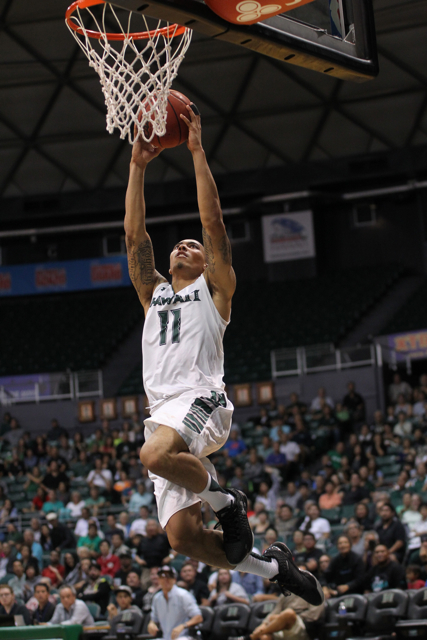 Instead, the University of Hawai’i basketball team endured a thrilling 101-96 overtime victory over Chaminade in an exhibition game. An announced crowd of 4,680 watched the Warriors rally from a 22-point deficit in the first half, as redshirt freshman Brocke Stepteau sparked a second-half surge. The final result and statistics will not count, but the Warriors and first-year head coach Eran Ganot certainly learned a lot against the NCAA Division II Silverswords. “It created some situations which were good for us; obviously we had to handle some adversity early,” Ganot said. Aaron Valdes led the way with 31 points and 14 rebounds while playing 44 of the 45 minutes. He scored nine consecutive points during a crucial stretch late in the second half, when the Warriors finally caught the Silverswords. Roderick Bobbitt had 21 points, 15 assists and six rebounds, and Quincy Smith contributed 15 points, six rebounds and six assists. But it was the play of Stepteau that had the crowd – and the Warriors – buzzing after the game. The 5-foot-9 guard, who sat out last season as a redshirt, went 4 for 8 from 3-point range and scored 15 points. Ganot said Stepteau earned playing time by turning in similar impressive performances during recent practices. 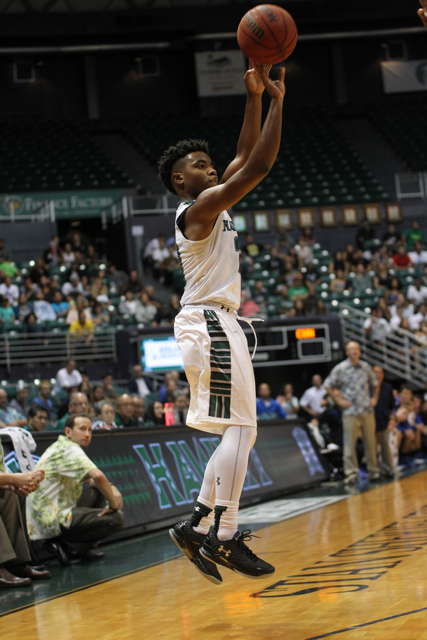 Stepteau’s 3-pointer with 1:14 remaining in the second half gave Hawai’i a 79-78 lead, its first lead since early in the first half. However, the Warriors were unable to secure the win in regulation, due in part to 3 of 6 free-throw shooting in the final minute. Chaminade’s Sam Daly scored on a driving layup with 6.2 seconds remaining in regulation to tie the score. Quincy Smith missed a 3-point shot from corner as the buzzer sounded, sending the game to overtime. Valdes and Stepteau each hit a 3-pointer during a 10-2 run early in the overtime that gave the Warriors control. Junior forward/center Stefan Jankovic finished with 12 points and three rebounds, but was limited to 14 minutes due to foul trouble. He fouled out with 3:58 remaining. The Warriors played without forward Mike Thomas (injured knee) and guard Isaac Fleming (out for personal reasons). What’s more, Chaminade went with a “small” lineup throughout the game, prompting Ganot to put in an impromptu lineup of his own for most of the second half. In particular, the 6-foot-5 Valdes was shifted to the center position so that four other guards (Bobbitt, Smith, Stepteau and Sheriff Drammeh) could matchup with the Silverswords’ quickness. Valdes had two dunks and a 3-pointer in the first five minutes of the game, when the Warriors took an early 15-11 lead. But the Silverswords then went on a stunning 29-3 run to take a 40-18 lead. The Warriors closed the first half with a 14-3 surge to cut the Chaminade lead to 43-32 at intermission. 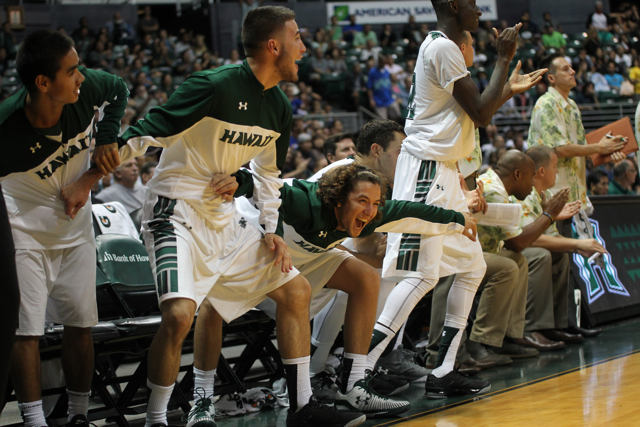 Hawai’i opened the second half with a 9-0 run, and the game stayed close the rest of the way. Kiran Shastri led the Silverswords with 20 points, and Sam Daly added 18. Kuany Kuany finished with 15 points and 14 rebounds, but fouled out with 1:21 remaining in the second half. 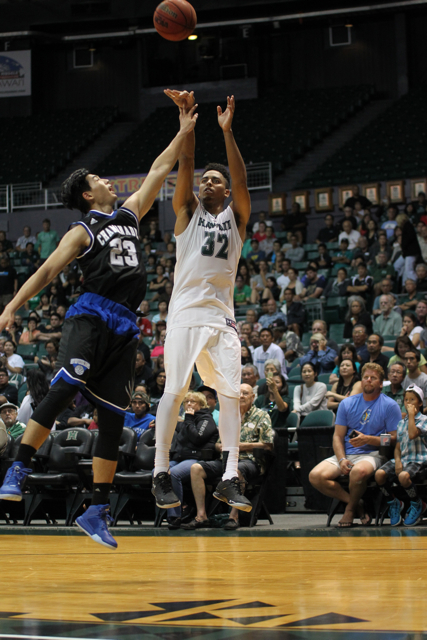 Hawai’i shot just 36.7 percent from the field in the first half, but improved to 43.6 percent for the game, including 5 of 6 (83 percent) shooting in overtime. The Warriors will open the regular season on November 13, when they host Montana State on the opening day of the Outrigger Hotels Rainbow Classic. Looks like Stepteau is stepping up to the task as Ganot pointed out he likes what he does. Hawaii seems pretty small with it’s line up and personnel and feel Ganot will need the shooters from outside the line. Valdes surprised me with his shooting abilities last year and he still surprises me today taking it and being consistent. How is Valdes dribbling come on? Can he take some defenders one on one with some moves around the rim or freeing some space for the jumper? Did he improve in those areas? If he had more body size and power moves… . Can someone tell me if Ganot ever called a timeout during their 19-0 run? Because I remember thinking, why aren’t you calling a timeout? And I don’t remember him ever calling one! I was not able to go so hard to judge off just the highlights. From what other people saying, this team still got lots of work to do and real season is next week already! I hope and pray Ganot and his coaches know how important Isaac is to the depth of the team and also that Isaac knows as well and he stay focused. I agree that if healthy Mike T and Isaac F in there then the game not as close. Thats still no excuse because even without those two UH should have enough firepower to beat a D2 team like Chaminade and not have to go OT. Good to see Stepteau step it up! Anybody there know what happened to Dyrbe and Niko? Are they still injured? Looking at the boxscore, Stepteau and Drammeh got lots of minutes and even Buscher got in the game, but no listing for Dyrbe or Niko. Nice to get a W even if it’s just an exhibition, and if they weren’t perfect. It’s more important to get live action to see how the team’s progress is with Ganot’s system. For those who didn’t make the game, a few observations. There was absolutely no defense. Chaminade ran thru UH like they were taking pre-game practice. It was almost to much to watch. A strong point last year was pressure in the front court. Except for the last few minutes there was none of that. With the shot clock now 30 seconds any delay caused by a pressing defense will deliver results. They scored 70 points in the second half to win. It looked more like a summer league game. Do any of you think we could score that many against a D1 school? We are suppose to rely on an outside three point game. 7 for 15 with 4 of them from one player?? 20% of our score came from the 3 point land. Is that what we are counting on to win games. Good question to ask the coach. Brocke got hot but missed everything in the first half. Must admit he was super tentative then and looked for someone to pass to rather than shoot. Actually that was most of the team who passed up many open 3 pointers. Brocke and others that can connect on the three need to feel free to shot . I left the Stan still waiting for a pick and roll. Ganot needs to work the refs. He wasn’t the only zombie in the arena. He must have been asleep when Chaminade made their run. A time out was the least he could have done. The biggest fan and most involved at courtside was Isaac Fleming. Overall I was not impressed but still remain hopeful. Hahaha! I squeeze my okole too! Chaminade was quick according to Dayton’s write up, so Valdes was playing center at times. Could be why Stef did not play that much. Although someone posted that Chaminade is neither big nor athletic, when i looked at their roster pictures they look athletic. They have 14 guards listed, 1 guard/forward, 1 forward and 1 forward/ center ( the latter two did not play last night). The “guards” are mostly tall ones, two 6-7, one 6-6, one 6-5; three 6-4 and one 6-3 of the ones that played 19 minutes or more. Kuany,6-7,15 pts, 14 rebounds and Daly, 6-4 are from AUSTRALIA; Pedroso from Portugal, Hu from Taiwan. Shastri, their leading scorer last night, is from California, but is of Indian descent i assume and did service in India this past summer with Sai Tummala, per Brian M. Kaleb Gilmore of Kalaheo is also on the roster. McInnis said on Bobby’s show today something like that UH went away from their set offense to get back in the game, could be in the second half. Thanks for observations and comments WI fans that went to games.. how I miss live in person being there.. darn old age..
well, Why does not.. if Eran is smart and uses strengths of team.. it appears. there ARE NO 3 point sharpshooters. like 40 percent from trifecta line.. like NWC..
that pick and pop, Popovich, 4 out 1 in.. okay guys can drive the lanes, openings , if rim clear layup or dunks. or drive and dish.. however when the guys move ball around and the guys.. not shooting well from 3 point land. other team gets rebound . gets it goes. and knocks down 4 or 5 threes in a row, UH down double digits in first 5 minutes. NOT good. Eran has to have the old returnees. return to last year’s type of ball, with discipline.. let them pressure, full, half court, three quarters. corner traps, mix zone, man, get deflections and go. fast break and some transition 3 ball launches, not too many just a few key ones. 20 percent from 3 line. and guys still not good FT shooters.. not good. I think Eran very smart guy, and Acker , Jacobsen, Montgomery, if Eran has their ear, and by RBC, if UH loses, let us say, 2 out of 3, and goes to Texas Tech and gets blown out.. hey if it ain’t working, the pick and pop, 4 out 1 in.. make changes that is what good coaches do.. fun too. for the fans. get up and go. however. with better ball movement. and discipline to close out games.. that is where Bobbitt comes in. excellent crunch time FT shooter.. however numbers so depleted.. without 2 starters. Janks , fouls out, and Bobbitt in OT.. tough season.. hey love that Zach and Brocke playing., sad that Dyrbe and Niko NOT seeing court.. wonder if they might just concentrate on school, talk with their parents, sit down with ganot. will WE enos and niko SEE any real time PT or just garbage time? Didn’t hear Bobby’s show but it was obvious they actually got penetration in the second half. During the first half Chaminade filled up the paint and let us miss 3’s. Some serious work has to be done. I want to put a shout out to Quincy Smith who played an outstanding game. He is truly the glue that holds that team together. The strength of this team and what was lacking in last night’s game was pressure defense. There was almost none of it the whole night. Bobbitt, Smith, and Valdes were highly successful in forcing teams to play their tempos last season. Chaminade a division II team was dictating the way the game was played.They raced out to a big lead and forced UH to go small to match up with them and cancelling out their height advantage. Everyone knows by now that our bigs are foul prone. Their plan was better than ours. I think it’s ok to implement a new offense such as the 4-1, but why throw away the other parts of the game in which this team was successful? In the long run you need set plays but you won’t be successful overnight because it takes time for a new system to be effective. And the reason the bigs were not effective I think were partly because they got into foul trouble— which seems to be their achilles heal from last year. This game is a wake up call. The team from last year would have rolled over Chaminade. We are essentially the same team except we are using work boots in a 10 k road race. Thank God it’s just exhibition. Now comes the hard part in trying to recognize and implement your strengths and limiting your weaknesses. Right before Quincy miss the last 3 before the buzzer, he got the pass from Stepteau. It was like the crowd expecting Stepteau to shoot it but then he pass to Quincy and everybody got quiet like “uh oh.” Funny. Not too funny was Tummala defense right before that. The Chaminade guy took him all the way to the rack for the 2. Uhf1, at least for last night, Brocke, 50 % 3 pt. shooter; Quincy, 50 %; Valdes, 37.5 %. Good, no Great, to hear that Issac was the biggest fan on the sideline. Nice to have these highlights. Mahalo. good, I think as a TEAM, at least all the guards / wings, and Janks, have to combine for high 30 to 40 percentage points from 3 ball line.. Even San Antonio, very effective from those spots..
islandman.. the danger.. funny really not.. eran might be in more a bind than benjy was. with MT.. chronic MCL sprain, Bobbitt secret ailment.. Janks banged up, maybe Jovanovich whose feet still not quick enough to stay with 6’7″ quick bigs who can score, go right around him. Sheriff, very thin and young hit some FT’s, Sai,.. he reminds of a Haim Shimonovich,. just a body, bang, and workman, nothing outstanding. he fouled out.. No Fleming, he not great 3 ball shooter. too. Okay, Eran, is going to say, in private., THIS NOT MY TEAM, or type of recruits.. the past coaches.. so I have to get the shooters and bigs that can run this offense and play that tough nosed straight up man defense with NO pressure, to avoid the runouts by other teams for easy baskets.. where does that sound familiar? oh yeah..Same philosophy as Riley / Bennett.. they play close to the vest so teams, don’t beat them down court. slow it down. however. we could see, or hear, or read about game.. even though short in bodies numbers, talent.. Rod, Quincy, Aaron, Brocke, with quickness, quick strike and steals. pressure. got them the lead in OT and they hung on to win.. big comeback. however against Montana st . I don’t know..
akuhead2 … Last year, Bobbitt got to the free throw line the 2nd most next to Valdes and his 73.3 FT % was third behind Nevels and Stef. Unless they are injured I was a bit disappointed that Drybe and Nico did not get any playing time. Since this was only an exhibition game you would think that Ganot would have wanted to see them in a game. Or are they performing poorly in practice and he doesn’t think they deserved to be playing. Drybe did well in the summer league and is very good with his outside shot. It looks like they will be riding the bench for another year? Montana St. was 7-23 and 4-13 (conference) last year. Current Pomeroy Rank is 318; UH is a generous 94. Finished in 3-way tie for last place in the 12 team Big Sky ( Montana was regular season champion and lost to Eastern Washington in the Big Sky tournament ). Montana St. beat Northwest Indian College (a Tribal College) in an exhibition game on Nov. 3, 114 – 57 . Bernie: I really feel bad for Dyrbe, remember he walkon, if on that student loan, can be paying back for years to come after he graduates..he had moments in his freshman and soph years.. hit some back to back threes.. that is what he does. know he does not have super quicks at this level. Niko? I don’t know. unless he is hurt, or is not getting Ganot system down.. I believe Dyrbe, if he taking business in classroom, this May or during summer session first or second 2016 , he is academically a Senior. so he can grad after this season and move on. I believe even Zach has moved ahead of him in rotation. .. that is the one thing Dyrbe, great local BB shooter, lacks.. the DI quickness and break guys down, or handle the ball with quicks. otherwise, he should spot up, and let the guards hit him.. he can knock down 3 ball. sad. .. Wish you well Dyrbe, a walkon under Gib, Benjy And now Ganot.. three different systems. and great friend bud of Fotu..
hope Dyrbe gets his degree within a year ! Bobby Miles is a junior player at DIV II Cal State LA, per Brian M. How do you figure when he played at UH in 2010-11 and 2011- 12. Some kind of exception ? Let’s remember that last year’s exhibition game against HPU was similar. UH struggled against the Sharks and were even behind at some points. Both HPU and Chaminade treated this like a national championship game, whereas UH started way too lax. We can’t let that happen, but I kind of understand the UH players going in thinking the W was already in the bag, despite what Aaron and Janks said before the game. Smith seems like the most improved from last year’s players. Way to go Q! I think Ganot should take a page out of Taylor’s book by not over coaching the players. It’s fine to finesse technique and add new plays and tactics, but there’s no sense in rebuilding something that wasn’t exactly broken to begin with. Ganot seems like a proud man, but he also seems very intelligent. Therefore, I’m confident he’ll acknowledge his mistakes and alter the team’s plays and tactics accordingly. Islandman … Standhardinger attempted 254 FT his last year. I think this is a valuable offensive tool, if only to get a little breathing time, or to help control the clock, or to prevent fastbreaks, but also to get some scores against really tough defenses. Not sure if the stats are correct, but I think Bobbitt had 133 attempts last year, and AV 154 attempts. I think Standhardinger was actually trying to get to the line, (as well as he could often hit those shots also, so, … for three.) (And if my reading of the stats are right.) I will say, it has to be the right person for the task, and that CS was a natural at it. Repeating a recall here: I was at the San Jose game in San Jose when Gib put Bobby Miles on Shamburger, Shamburger’s last year in San Jose, and Miles just smothered Shamburger. He outhustled him all over the court. Very impressive showing. It was a good day to be cheering for the Bows. Glad to see Bobby Miles back in school. Islandman… My wife’s nephew plays on that Northwest Indian College team that Montana State demolished. NIC is a two year school. They came down for a UHH tournament last year. I’d put them at the level of a good high school team. Won, we credit the players (this one, esp the ‘small’s). Just keep improving with diligence. Our moral support will always be there! N2o4 joy, we don’t always blame the coaches for a loss. We love to blame the crazy zebras and trust me in our conference our conference our zebras love to give the visiting team home field advantage on 50 50 calls. Blame comes on coaches when they don’t do basic things they would know how to do. Like substiutions toward the end of a game (offense/defense) to have either a beter defender or shooter or protect someone from a foul when on defense. (Something bob Nash was absolutely clueless about). Play calls after a timeout. Having a bad free throw shooter in the game at the end of a game when the other team is fouling. Yeah! Per Brian McInnis… Isaac Fleming is back! Mike Thomas is also practicing! Folks questioning the lack of baseline-to-baseline pressure defense should keep in mind that Ganot was working with a short bench. No Nevels, no NWC, no Fleming — that’s three guys who did a lot of pressing last season. In their place Ganot had walk-ons and freshmen. Plus he had to keep Aaron in the front court to counter Chaminade’s small ball strategy. As a result it was obvious he was going to have to play Rod and Quincy almost the whole game. I don’t blame him for settling for less aggressive defense so as to save those guys’ legs for late game action. As it was Quincy was cramping up near the end and both he and Rod looked out of gas at the close of overtime. I think having Isaac back will make a huge difference, not only because of his offensive skills but because his presence in the rotation will allow all of the guards to burn more energy on defensive pressure. Chaminade is a good team and will do well this year! Good 3 point shooting, ball movement, penetration, and hustle. Just watch the flying elbows. Many great comments by others that I have to agree with. One thing that gets me is where was the front court trap or pressure? This is where the team excelled so well last year and led to points of steals or passes out or bounds by other teams. Ganot knows that the team has things to work on and will address them during the next week of practices. Let’s hope that injuries will heal, personal problems will be resolved, and disciplinary actions will be lifted. Brocke has good Bball IQ, has decent handles and is very composed young man .Sherriff has length and athletic ability. I’m not the mod, but wouldn’t use the u word; last thread you used it on another player too. All of the players have some use and are useful in their own way. He gets fouled-out many of a game. I love to yell at the referees. YOU MUST NEVER USE ANY FOUL LANGUAGE! If you do they won’t listen to what you say. I do hope we use a stent full court press imagine how tired the other team will be havng jus flown 6+ hrs the day before. I like a lot of things that inhave heard of Ganot and I hope he can put it all together. Is To SEE The Basket before they leave their feet…. at least he wasn’t hesitating like So Many in the first half (even Stepteau). CAN You Imagine a Fully Mature Team Leader in Isaac? To ‘Hall of Fame’, Circle of Honour’? How’s ‘Bout Counting on Winning Three This Coming Week/Tourney!? Hawaii’s full court press last year was a game changer where team failed to get the ball across the half court line numerous times. With the lower amount of time on the shot clock it will also pay dividends by not letting the opposing team get into their sets as early. maybe with Thomas and Fleming back, IF Eran really sees the strength in this team, actually from last year’s tons of video of their games.. HE knows, pressure, steals deflections and strike early transition.. weakness. .. really disciplined tight can score in a half court set when game on the line..and lack of 5 or 6 great three point shooters.. I dont care if its preseason, exhibition, or scrimmage. One stat that is a red flag from this game is the fact that UH got outrebounded by 10 to an extremely smaller Chaminade squad and had only 2 more blocked shots. Even with 2 players out for UH, there was no excuse for that. And UH is lucky their reactions to calls didnt get them T’d up from the zebras because in the BigWest, they will get called for the antics. Chaminade is expected to finish 5-6th in their league according to the coach’s poll… and nearly took UH to the brink of an upset. A lot to go back to the drawing board with for the Bows. P.S. UH really shouldve only won by 3 points if were being honest that layup the refs counted at the end of OT was quite generous. In the video, it seemed that Brocke got the shot off just before the buzzer. Chaminade is not extremely small vs. UH for those that played much of the game. They had two 6-7, one 6-6, one 6-5; three 6-4 , one 6-3; and one 5-10 player that played 19 minutes or more. UH had Janks at 6-10 who played 14 minutes and Stef, 8 minutes. After that,we had Sai, 6-6, Valdes,6-5, Rod, 6-3, Quincy, 6-1, and Brocke, 5-9. Sheriff, 6-3, played 17 minutes and the other five played 32 or more minutes. Valdes played center for some of the game. For Our Outside-Hawai’i Fans, et.al.. I tell you Eran, best case scenario.. Hawaii to be in with new wife..that is good, though things very expensive,.. he can afford at near 200k per year 3 years..
so Eran has that team, that can come back from 22 points down.. we seen it last year too.. However, we all KNOW.. to win championships.. have to have excellent half court sets.. with Rod, maybe one day Fleming.. and Quincy.. or Sheriff,.. Brocke .. running that 4 out one big in.. to close games.. they can win the close ones..
Well, what can I say.. as eagle and servante the originals of the WI comment posters…new HC.. and same Warrior guys.. hope for some wins.. imagine in Warriors/ Bows win the DHC? That would be huge.. that would signal.. UH can win the BWC..tourney.. Almost hoops time ! My favorite time of the year.. and the Rainbow Warriors chance to win some games !! Rebounding.. even last year, not UH strength.. smaller, or similar sized teams. out rebounded UH.. however Garrett Nevels. cannot say enough about him at about 6’2″ playing hurt. .could rebound with the bigs…Need rebounding by committee. again..
Hope ganot .. he has to.. .. JC route probably.. get some guys that can score inside.. and rebound defend.. then UH will be solid for Post Season against the REAL big boys. can affect dreaded APR.. That is probably as harsh a sanction as alleged UH ones they dealing with.. that APR .. if go down… could be One year post season ban.. hope not..
One thing about your comments.. very real, practical.. loyal UH MBB supporter.. all UH sports.. however you hold the top people accountable. which is only pono..
back on topic moderators. .. good comeback win.. video for ganot.. and now. hard to believe First game of season against Montana St. is here this Friday at SSC.. for those that can go this Friday…GO and support the Bows/ Warriors.. in house if have 5000-6000 would set the tone.. theme night? Warriors and fans just want to win baby ! going be Real Interesting year.. hope guys stay healthy..
we support the Bows/ warriors..